The physicians at Denver Spine Surgeons are board-certified and fellowship-trained in orthopedic spine surgery. Three of the spine surgeons, Dr. Ghiselli, Dr. Jatana and Dr. Wong have practiced together in Denver as colleagues for over 10 years and are pleased to announce the addition of Dr. Okezie K. Aguwa to the practice. Denver Spine Surgeons are referred back pain and neck pain patients from across Colorado; including Colorado Springs, as well as from adjacent states of New Mexico, Nebraska, Wyoming and Kansas. 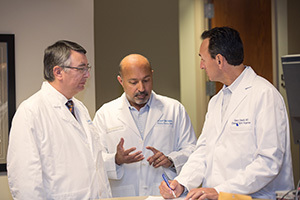 Dr. Ghiselli, Dr. Jatana, Dr. Wong and Dr. Aguwa emphasize non-surgical treatment options in advance of spine surgery through a network of pain management specialists and spine therapists. When surgery is necessary, the spine surgeons perform minimally invasive spine surgery so the patient can be home later the same day to recover in the comfort of their own home. 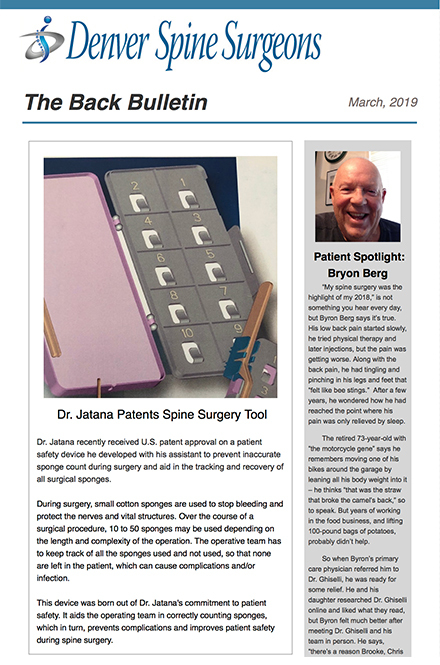 Because Denver Spine Surgeons specialists consult regarding each individual case, the most appropriate back and neck pain treatment plan is outlined for every patient.